Add all ingredients to a high-powered blender. Blend until smooth. Pour into six 2-ounce popsicle molds (my 2-ounce molds hold about 1/3 cup liquid each). Freeze for at least 4 hours. Run the molds under hot water for 10-30 seconds to release the popsicles from the molds. 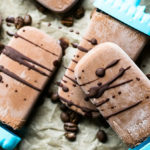 If desired, drizzle popsicles with melted chocolate before serving (it will harden from the frozen popsicles). Enjoy!